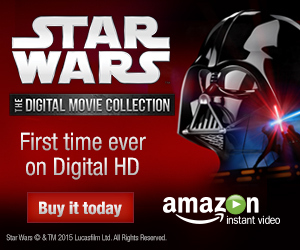 So much about Star Wars: The Force Awakens has captured my interest. It's not just anticipation for the movie itself but also the greater suspense of, if the movie is well-received, how much bigger the Star Wars advertising empire might grow than it already is, and if it is not well-received, what might happen to a decade's worth of future movie plans that all hinge on this one film. There's also the ways the Star Wars franchise under Disney has bravely inserted itself into efforts toward greater diversity in popular science-fiction, which will also be dealt a victory or a hindrance based on the reception of the movie. I've equally been interested in the controversy over Disney/Lucasfilm rebooting the Star Wars licensed continuity. I've experienced something similar twice before, both when DC Comics ended their post-Crisis on Infinite Earths continuity in favor of the New 52 and also when the Star Trek movie franchise restarted with JJ Abrams. In each of these examples, the company had an event in which the old continuity handed off to the new, and I wonder if such might have helped here in mitigating fan outrage. Also of course for Star Trek, the movies got a new continuity but the licensed fiction remained ongoing; for DC, we did finally get a brief visit with the old continuity in Convergence, though that was some four years after they launched the New 52. My suspicion is Star Wars "Legends" fans will get their due -- if only because media companies don't tend to leave money on the table -- though I'm not really surprised Lucasfilm doesn't want to be publishing in multiple continuities this early in the new venture. On the licensed tie-in side, the Star Wars group seems to have a curious strategy of novels that focus on new or side characters, and then comics that more specifically star the movie characters. Having found two new Star Wars novels somewhat dry, my guess is my Star Wars extracurriculars will mostly be the comics. I enjoyed Marvel's Star Wars Vol. 1: Skywalker Strikes, though I was cognizant in reading it of frequent Collected Editions commenter dl316bh's suggestion that the new Star Wars material was perhaps too "safe." As compared to the Expanded Universe's births, deaths, and world-building, can a comic set between A New Hope and Empire Strikes Back -- when we know everyone's going to make it through every adventure with all limbs intact -- really hold any suspense? The answer is yes, no, and it's interesting to see what kind of knots writer Jason Aaron can tie himself into. The thing about these new "Lucasfilm group approved, totally 100% in continuity" stories is that either nothing can happen that doesn't perfectly align with the movies, especially between Episodes IV and V, or things can happen that don't seem to align with the movies but you know that someone somewhere has already checked them out and decided it's cool, and then there's engagement in figuring out how it works. And Aaron does both here. Skywalker Strikes does tend to play it safe with Han and Leia, I think, but intriguingly less so with Luke; to some extent this book is mostly prologue to the events at the end, which begin to suggest what this series will really be about for a while. The odd politics of Skywalker Strikes are best seen in Luke Skywalker's two major confrontations here: one with Darth Vader, and one with Boba Fett. Luke versus Vader is Aaron and company's first big shot across the bow, since I didn't think Luke had met Vader prior to Empire, though again, I'm confident someone's already gone through and found the hole in the dialogue that makes it possible. At the same time, Aaron is sure to blind Luke just before his skirmish with Fett, such to preserve Luke never having "met" Fett before. If there was a loophole for one, I'm surprised there wasn't a loophole for the other, and this is the weird place the book exists -- sometimes bravely out in the deep end but then other times with one hand securely holding the side of the pool, with no clear reason for one versus the other. The Luke parts are the best part, and especially once Luke and Vader begin dual quests for insight on Tatooine. 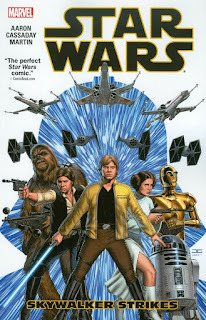 To get there, it was surely incumbent on Aaron to write a Star Wars shoot-'em-up with Han and Leia in a stolen AT-AT Walker and Luke on a speeder bike versus Vader and a legion of stormtroopers, but it's three issues with more action really than character development. And whereas there is interesting material about Luke trying to place himself within the Jedi legacy (and a wonderfully ironic moment in which he whispers to his imagined father as he escapes the blaster fire of his actual father), Han and Leia are reduced immediately to the same flirtatious bickering they'll do throughout Empire with no new or different nuances. In the book's final pages, Vader gets his answer to the mystery of who destroyed the Death Star, and on hearing "Skywalker" he nearly blows the side out of a Star Destroyer. Though the Star Wars comic reaching Empire appears forestalled at least by Leia not yet choosing Hoth for the new Rebel base, obviously Vader learning Luke's parentage moves us firmly out of just-past-New Hope territory. That's surprisingly fast, which suggests to me there's more to it, and what the Star Wars comic becomes now is the story of Vader hunting and fighting the Rebels all the while knowing his son is among them. That Vader has more knowledge than Luke, Han, and Leia is awkward from a storytelling perspective especially since Vader has his own Marvel comic; the Vader character now has all the dramatic motivation here, while the good guys don't have as much. Clearly none of this is an accident on Aaron's part and so I'm left wondering about the twists and turns to come; it's only unfortunate that the real meat of the book doesn't come until so late. I know coming up Jason Aaron excerpts from Obi-Wan Kenobi's journals, perhaps specifically the Kenobi/Jabba the Hutt feud hinted at here, which itself offers the basis for a whole series. I'd stick around for that, and for the lauded "Vader Down" crossover, though it all still seems tertiary to what this book will actually be -- Luke learns more about the Jedis? A procedural about building the Hoth base? In the meantime, Aaron's Star Wars Vol. 1: Skywalker Strikes is enjoyable and likable, finely drawn by John Cassaday; it does indeed read "safe," but I'm hopeful there's danger yet to come.